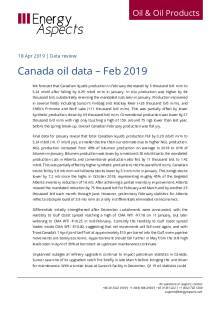 Users licensed for the data service can access our Canadian oil demand and production data and our Canadian crude balances. We forecast that Canadian liquids production in January fell by 0.44 mb/d m/m to 5.05 mb/d (-16 thousand b/d y/y), led by a 0.31 mb/d m/m fall in bitumen production due to the Albertan government’s mandated production cuts. In-situ production was lower by 69 thousand b/d m/m due to decreases across multiple facilities including CNRL’s Primrose and Wolf Lake (-15 thousand b/d m/m) as well as its Cold Lake production (-11 thousand b/d m/m), ConocoPhillips’ Surmont (-25 thousand b/d m/m), as well as Husky’s Sunrise (-12 thousand b/d m/m) and Suncor’s Firebag and MacKay River (-14 thousand b/d m/m). This was partially offset by higher synthetic production, up by 40 thousand b/d m/m. Conventional production was 14 thousand b/d lower m/m, led by onshore declines. Final data for December show total Canadian liquids production increased by 37 thousand b/d m/m to 5.49 mb/d (+0.27 mb/d y/y), versus our estimate of 43 thousand b/d m/m fall. The discrepancy is due to higher NGL production vs our estimate of a fall. Synthetic production came off from November’s all-time high, lower by 70 thousand b/d m/m at 1.17 mb/d. This was offset by higher conventional (+43 thousand b/d m/m) and bitumen output (+32 thousand b/d m/m), as well as higher NGLs output (+33 thousand b/d m/m). Canadian January demand fell by 0.28 mb/d y/y to 2.01 mb/d, led by LPG (-87 thousand b/d, y/y), amidst milder temperatures. November and December demand were each revised down by 0.12 mb/d to 2.45 mb/d and 2.25 mb/d respectively driven by downward revisions in gasoline and LPG. Full year 2018 demand fell by 15 thousand b/d to 2.34 mb/d. Canadian gasoline demand fell by 35 thousand b/d y/y to 0.70 mb/d in January, with the Consumer Price Index (CPI) increasing y/y by 1.4% (+2.1% y/y, excluding gasoline). Gasoline prices fell by 14.2% y/y in January. The number of people employed increased 1.8% y/y by 327,000, while total hours worked increased by 1.2% y/y. However, the unemployment rate increased by 0.2 ppts y/y to 5.8%. Employment rose in six provinces, led by Ontario and Quebec, while Alberta and Saskatchewan reported declines.